The study aimed to explore the social, environmental and governance (SEG) reporting practices of Banking sector of Bangladesh. In conducting the study, the longitudinal data has been used over the period 2000-2015 taking all the 30listed private commercial banks in Dhaka Stock Exchange Limited. Three separate reporting index for social, environmental and governance have been developed to measure reporting practices using the dichotomous method from the published annual reports of banks. The analysis found that corporate social, environmental and governance reporting has been increased over the study period. The statistical measure showed that social, governance and environmental reporting were made 46%, 49% and 1% respectively over the period while total SEGwas 39% over the period. The econometrics models using fixed effects showed that corporate profitability, size, age and leverage have positive impact on SEG reporting. The main cause of low SEG reporting could be due to the insufficient laws and framework of SEG reporting. Reporting of financial and non-financial information has an impact on business organization, since it controls stakeholders in making decision. Corporate financial reporting aims to provide useful information in a wide range of users to make economic decisions (Harahap,2003). It plays roles The development of financial sector help economic growth but the magnitude of the impact on the level of development (Mavrotas & Son, 2006). Rather than capital accumulation, financial development imbued per capita GDP through efficient allocaltion of resoures. (Ahmad & Malik, 2009). There is a positive relationship between economic growth and financial sector (Economics, n.d.). Banks and share market can play a significant role in the economic development of a country (Levine, 2003). A number of studies have concluded that countries with better developed and transparent financial institutions tend to reach economic development faster than other countries (Goldsmith, 1969; Mckinnon,1973;Murinde and Eng,1994; Levine,1997; Beck and Levine, 2002) although there is another view against it but enough empirical evidence is absent behind it(Hossain,2008). But the economic growth is related to environmental protection and it is difficult for companies to efficiently integrate environmental protection in the process of economic growth(Autio, Nguyen, & Nu, 2011).Corporate reporting played the vital role as it the medium of communication between the management and the stakeholders in banking sector as it opaque to public (Hirtle,2007). Considering these, International Accounting Standards Board (IASB) has developed some unique financial reporting standards for banks and some other international organizations have developed some operating standards for enhancing transparency and accuracy in governance to the market participants and the interested stakeholders so that bank's performance can be assess truly and fairly . In completion of financial performance firms should considers social and environmental performance with a good governance otherwise the financial performance will not be sustainable. 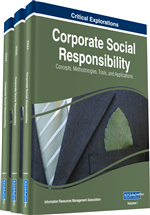 There are the three theories behind corporate Social, Environmental and Governance (SEG) performance viz. stakeholder theory, legitimacy theory and agency theory and in fact there is no differences in the utilization of those theories among the countries with high disclosure environment, countries with low disclosure environment and transcontinental of SEG aspects(Prastiwi, Subroto, & Brawijaya, n.d.).A social responsible organizations considers long run benefits instead of short run in planning and making decisions(Benabou, Tirole & Benabou, 2009).SEG reporting affect firm's performance because these reduce cost of capital, improved firm image, lower residual risk as well as lower reputation risk and specially when markets become sensitive to certain market conditions then SEG performance of the firms becomes more important (Pasquini- Descomps & Sahut, 2013). The value to shareholders can be enriched if firms consider their size along with the concern towards environmental, social and governance causes of society(Sharma & Thukral, 2015). However, there are a few criticism against SEG performance and it is stated that corporate do the activities only to increase the profit complying the laws(Bénabou et al., 2009). Corporate social activities have an impact on worker life (Elias & Saha, 2005) and financial performance (Ortas, Álvarez, & Garayar, 2015). Sometimes environmental responsibility performance score presents a negative relationship with financial performance whereas the governance responsibility performance score presents a positive relationship but there is no statistically significant evidence of a relationship between the social responsibility performance score and financial performance (Han, Kim, & Yu, 2016). In fact due to several and different reasons the prevailing methodologies and the corporate evaluation and reporting activities are unable to fully assess the quality of the corporate relationships with the stakeholder groups (Tencati, 2015).